Optional: Direct Students to the Treasures of Canada Webquest in the Youth Section to use directly from the web site. One computer with Internet access for each student; students can work in groups of three if there are not enough computers. Ensure students have been introduced to one or more of the themes covered by the artifact collections: aboriginal history and cultures, French-Canadian history, and immigration. Visit the Crossroads of Culture web site. Select the Objects tab, and view the available categories of objects. Select a category from the side menu, and then at the bottom of the page, select "View all items in the collection". A list of objects is displayed. Select the link for an object to display a detailed version. Visit the other two web sites, Marius Barbeau and Gateway to Aboriginal Heritage, which are similarly organized. The Gateway to Aboriginal Heritage site has the added feature of a clickable map of Canada that links to artifacts from aboriginal groups in each region. Familiarize yourself with the Treasures of Canada Webquest. Introduce the Treasures of Canada Webquest to your students. Explain that they will be searching for objects from the Canadian Museum of Civilization's collection to complete the Webquest. 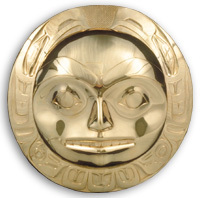 Introduce the Canadian Museum of Civilization artifact collection. Explain that the Canadian Museum of Civilization has thousands of artifacts related to aboriginal history and cultures, French-Canadian history, and immigration to Canada: everything from clothing to furniture to dishes to tools. Many of these artifacts are not on display in the museum; that's because there is not enough space to display all of the museum's artifacts. Fortunately, many of them are available on a database on the museum's web site, and today, students will have the chance to search for objects of interest to them. Ask students to log onto the Internet and go to the Treasures of Canada Webquest. Have students follow the instructions on the Webquest. When students have completed the Webquest, the groups present their artifacts in the format of their choice. Ask them to discuss their impressions of the database, and how they might use it for homework or other purposes.